2 sets Apple AirPods (Brand New) Bluetooth Stereo Headsets. 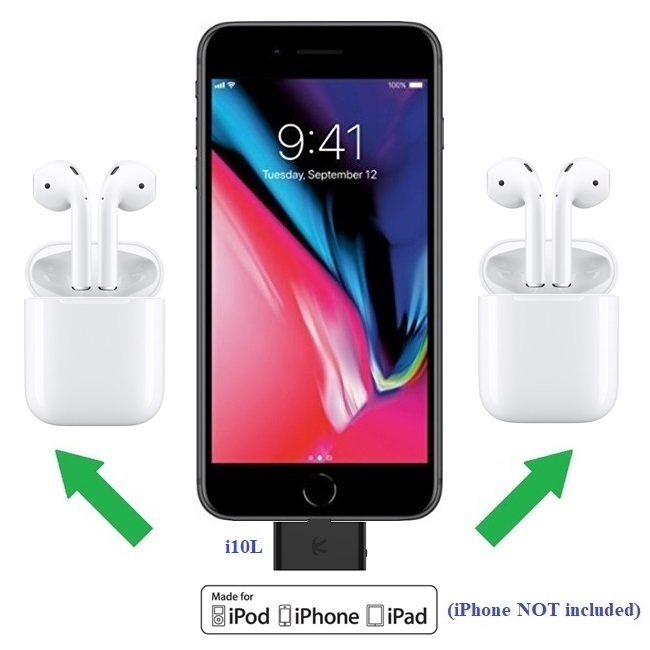 i10L wirelessly transmits DIGITAL Stereo Music from iPhone/iPad/iPod Touch concurrently to the 2 sets (1 set = 1 left and 1 right) Apple AirPods wireless Bluetooth stereo headsets. Remotely control iPhone/iPad/iPod Touch (play/pause/next/previous) from any of the 2 sets Apple AirPods Stereo Headsets. Plug and Play : Put 1st set AirPods headset in pairing mode, plug i10L into iPhone/iPad/iPod Touch, i10L auto pairs and connects to 1st set AirPods headset. 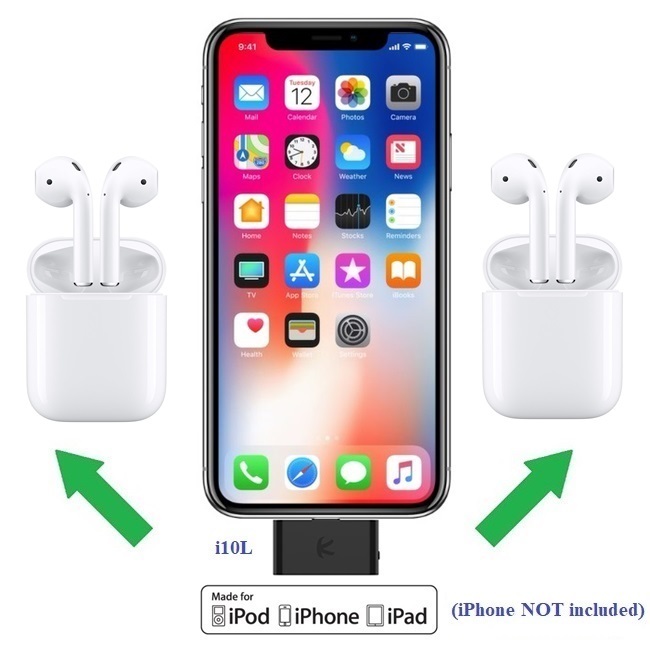 Put 2nd set AirPods headset in pairing mode, press button on i10L to pair, connect and stream to both sets AirPods headsets. 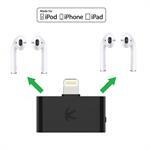 i10L_plus_2AirPods offers the unique innovation to wirelessly share your Lightning Connector iPhone/iPad/iPod Touch music concurrently with 2 persons, each with their own set (1 set = 1 left and 1 right) of Apple AirPods. Elegant solution with no unsightly wires. 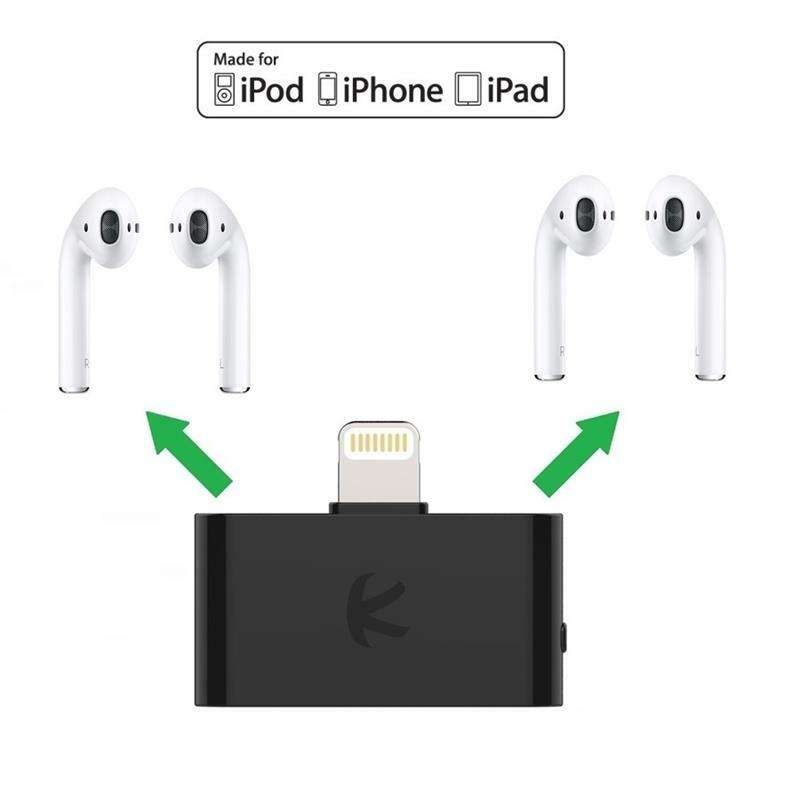 From the stereo headsets, any one of the 2 sets AirPods headsets can remotely control the iPhone/iPad/iPod Touch: pause/play/next track/previous track. The 2 sets (1 set = 1 left and 1 right) Apple AirPods wireless Bluetooth Stereo Headsets are the latest fashion Bluetooth Stereo headset, that works for both Music and Voice. AirPods (Music and Voice) have integrated micro-phone and re-chargeable battery. Ideal for home, office, outdoors, parks, hiking, dancing, skating, running, family enjoyment.